A History Vortex Conflict. All great literature is a series of conflicts. Whether drama, fiction and yes, even science fiction, a good story features a series of conflicts between an antagonist and a hero (or heroes). Like our own lives, we yearn to see adversity triumphed over, the good defeat the bad, the world set right, and in the same way, there would just be very little interest in stories which hold no person interest to the reader. Regardless if the reader can directly relate to the characters of a given story or not, the reader can connect with the moral issues presented when characters are pitted against each other. The most famous pairing of antagonist in literacy history is, without question, the pairing of Sir Arthur Conan Doyle’s Sherlock Holmes against his arch rival Professor Moriarty. Presented as the “crown prince of crime,” Moriarty is every bit as good an observer and deduser as Holmes. Cunning and sly he is the perfect antagonist to Holmes. And despite only appearing in one of Conan Doyle’s stories (The Final Problem, published by The Strand Magazine in December 1893), he is forever linked as the Great Detective’s greatest nemesis, appearing in several versions of Holmes’ adventures not penned by Doyle. In the world of Doctor Who, the Holmes/Moriarty conflict is mirrored in the characters of both the Doctor, and his arch rival, The Master. Like both Holmes and Moriarty, both the Doctor and The Master are equal matches for each other, each a genius in their own right, one dedicated to justice, the other to total chaos. The character of “The Master” made his on screen debut during the eighth season of the program in the Jon Pertwee story Terror of the Autons. Played by Roger Delgado, the Doctor is warned in the episode by the TimeLords that his old nemesis has arrived on Earth. This would be the first “official” sighting of the renegade TimeLord within the shows broadcast continuity, and the character would be featured in every story of the eighth season. Yet clues within the series suggested that the Doctor and The Master have a long history together, and while it is stated within the program that this was the first time the viewers are “introduced” to The Master by name, it is not necessarily the first time the viewer had seen the character in the series. Did The Master have an encounter with the Doctor in the series before Terror of the Autons? Here’s what we know about The Master as pieced together from clues within the series. The Master, like the Doctor, is a TimeLord from the planet Gallifrey. He attended the same university as the Doctor (scoring slightly higher in spatial physics than the Doctor), and it is suggested, but never out right stated, that the Doctor and him were once friends. It is also implied (but never stated) that The Master may have had a hand in an event in Gallifrey’s past which became the catalyst for the Doctor and Susan to “borrow” the TARDIS and flee. Even with the lack of facts from this period in TimeLord history one fact is known, both the Doctor and The Master became fugitives from their home world. I should point out at this point that others from Gallifrey have also taken this path, most notably The Rani (who was also a contemporary of the Doctor and Master) and the Meddling Monk, who was from a time period on Gallifrey several years after the Doctor had left (we are never told how long the Doctor and Susan have been “on the run” before the events of An Unearthly Child). Having fled his home planet of Gallifrey, The Master eventually arrives on the planet of the War Lord, offering the inhabitants of this hostile world TimeLord technology in return for a position within the War Lord’s government. Adopting the title of War Chief, he begins building TARDIS-like time machines for the planet’s military forces. Hoping to conquer all planets in the galaxy, the inhabitants kidnap humans from various time periods during Earth’s many wars, stopping with the 1917 conflict of The First World War. Their plan, have the “brainwashed” humans fight out their various battles, and use the survivors as the ultimate invasion force. Unfortunately for them, the Doctor stumbles into their 1917 time zone. Recognizing The Master, he begins to put a stop to the War Lord’s plans, deprogramming the humans and organizing them into a resistance force. Learning that his War Chief (The Master), intends to betray him and seize power for himself, the War Lord orders his execution, apparently killing the War Chief. The Doctor, realizing that he has no practical way of returning the kidnapped humans to their own times, calls on his own people for help. The War Lord and his scientists are captured and put on trial by the TimeLords, who return all the captured humans to their proper time zones. Grateful for his help, but unhappy about his “interference” with other planets, the TimeLords exile the Doctor to 20th century Earth, but not before effecting his third incarnation. The Master, forgotten, apparently regenerates and escapes. It is obvious that both the Doctor and the War Chief know each other. Both react with surprised recognition and alarm when they first come face to face during the War Lord’s training conference (the Doctor and Zoe having smuggled themselves into the War Lord’s base). The War Chief also knows the Doctor’s “secret,” of having stolen the TARDIS and fleeing their home planet. This would suggest that the War Chief was still on Gallifrey (possibly in prison? ), when the Doctor and Susan fled. While the actual character of “The Master” would not be created for another 2 years, it is not too far of a stretch to view the War Chief as an early incarnation. We never see the War Chief’s body taken by the TimeLords, so it is very possible that his regeneration takes place off screen (we have seen several instances where regeneration takes place several minutes after “death,” especially in the FOX TV movie). Edward Brayshaw plays the part perfectly; vile, sly and scheming to over throw his allies, he is everything that The Master would become. Brayshaw even looks the part, sporting a typical short cropped beard and slicked backed hair. It is easy to assume that The Master and the War Chief are one and the same, and far more logical to connect the two than connecting The Master with the Meddling Monk, as some fans had suggested in the early 1980s. The Monk’s motivation were never as sinister as the Master’s (the Monk being more of a wandering meddler), and he never held any ambisions of taking over the universe. Edward Brayshaw has appeared in several television series, including Doctor Who, The Advengers and The Saint. In 1964 he played opposite the 1st Doctor, William Hartnell, as Leon Colbert in The Reign of Terror. His film credits include Rentaghost (1976), and The Trouble With Women (1970). Having regenerated, The Master heads for 20th century Earth for a re-encounter with the Doctor, but not before picking up “a few new tricks,” including a weapon that kills leaving doll-size corpses. Offering his services to a number of would-be invaders The Master causes untold damage, coming very close to destroying the world. At one point he even returns to Gallifrey, stealing files from the Matrix (Colony In Space) and using this information in his quest for power. He is finally defeated and imprisoned on 20th century Earth by the Doctor and UNIT while trying to resurrect the power of the Daemons. Escaping however, he continues to plague mankind and the Doctor, attempting to control the temporal power of a Kronavore (and thus destroying Atlantis), and finally teaming up with the Daleks in their plans to cause a space war between Earth and Draconia in the far future. His plans (including the ones hatched out with the Daleks) are of course, all defeated by the Doctor, but not before The Master almost mortally wounds his arch foe in their last encounter. With the Doctor near death and the prospect of war between Earth and Draconia avoided, The Master once again escapes into the vortex. In Terror of the Autons the TimeLord that warns the Doctor about The Master’s arrival on Earth mentions that he had “picked up a few new tricks since their last encounter.” This quickly establishes that both The Master and Doctor had dealings before, possibly during the Doctor’s encounter with the War Lord. Considering that the Doctor has very little regard for The Master’s “abilities” before the Auton encounter, one can suggest that their previous encounter (or encounters), was limited. It is also important to note that the previous encounters had to take place during the Doctor’s first or second incarnations, as his third incarnation was immediately exiled to Earth. 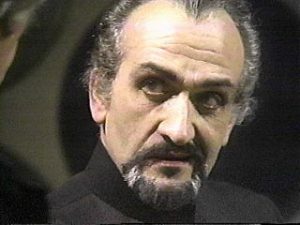 Roger Delgado of course, is the quintessential Master, having established the role so convincingly during the 1971 season. His trademark looks and mannerism molded the character into the perfect nemesis for the Doctor. At the end of Frontier In Space it is assumed that The Master flees the Ogron planet, possibly running from the Daleks to escape their wrath at having failed in his attempts to start the war. 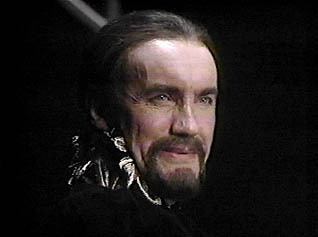 The last on screen appearance we see of Delgado as The Master is of him shooting the Doctor at the end of episode six. Of course there had been plans for a final confrontation between both the Doctor and The Master scheduled for Jon Pertwee’s next and final season. 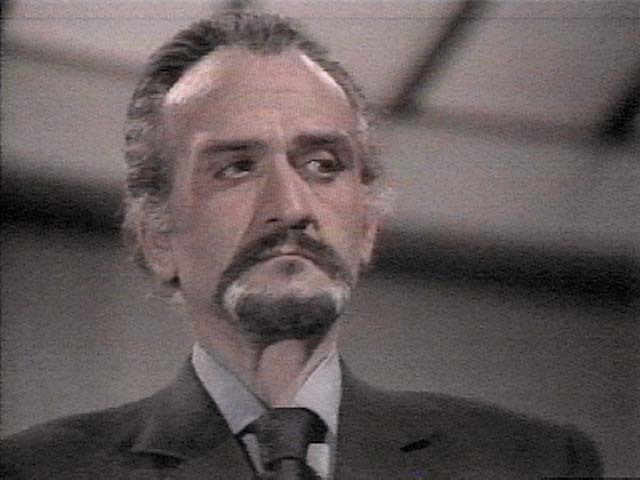 Roger Delgado’s untimely death in June of 1973 put an end to those plans, and the character of The Master would not be used again in the series until 1976. Roger Delgado’s film career began in the early 1950s with the role as a Kalikan policeman in The Captain’s Paradise (1953). Since then he had been featured in over 35 films including The Bells of St. Trinian (1954), The Battle of the River Plate (1956), First Man Into Space (1959), The Road to Hong Kong (1962), The Mummy’s Shroud (1967), and Anthony and Cleopatra (1973), Besides Doctor Who, some of his television credits include Quatermass II (1955), The Buccaneers (1956) and The Adventures of Don Quixote (1973). Dying and unable to regenerate, The Master returns to Gallifrey in a last attempt to both extend his life, and defeat the Doctor once and for all. His body degenerating, he lures the Doctor back to Gallifrey, framing him for the assassination of the President. He then plans to open the Eye of Harmony, the Black Hole which gives the TimeLords their power of time travel, absorbing it’s power in the hopes of extending his life. With Gallifrey in the balance, the Doctor quickly exposes his old nemesis’ plan, defeating his old rival just as The Master is about to unleash the power from the Eye. With the Doctor cleared of all charges he departs Gallifrey, followed by The Master, who has slightly regenerated. It is never satisfactorily explained exactly how The Master’s body got to the degenerative point seen in The Deadly Assassin. It is suggested within the episode that The Master had just “come to the end of his regeneration cycle.” The problem with this explanation is that it suggests that The Master is much older than the Doctor (the Doctor only up to his fourth, The Master having completed his 12th). This point however, is disputed by earlier Master stories during the Pertwee era which suggest that both The Master and the Doctor are contemporaries. Terrance Dicks expanded on this explanation in the book version of the story, explaining that The Master had continually forced himself to regenerate in order to disguise himself for various plans, and thus reached his 12th regeneration. John Peel presented an interesting theory in his Legacy of the Daleks novel, where The Master’s condition is the result of an encounter with the Daleks of 22nd century Earth, and the Doctor’s granddaughter Susan, who uses The Master’s TARDIS (after causing his degenerative condition), to escape 22nd century Earth. 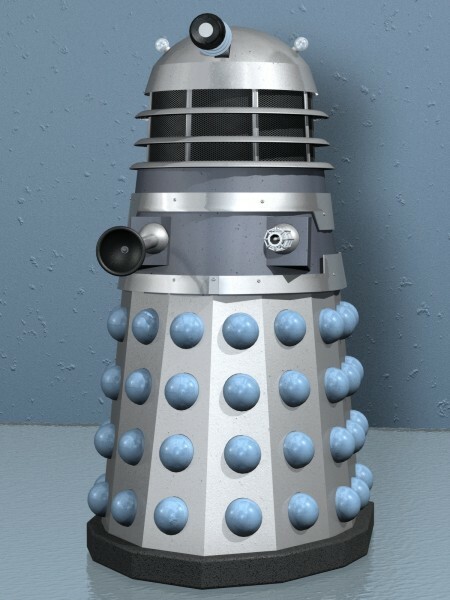 Another explanation could simply be that after his failure to ensure war between Earth and Draconia, the Daleks simply hunted him down and “exterminated” him. To portray The Master for the episode the production team used a static mask fitted over Peter Pratt’s head, only the mouth piece showing movement. The look is very effective, as The Master’s skull-like face shows no life to it. Interestingly enough, during the Matrix sequence, the antagonist plaguing the Doctor on the train and with the plane, hidden behind goggles and a face skirt, looks somewhat like Delgado’s Master. Peter Pratt is best known for his work with the D’Oyly Carte Opera Company from 1945 until 1959. After leaving the company he turned his attention to theatre, television and radio work. He was a member of the BBC Drama Repertory Company in the 1960s, starring in a series of complete Gilbert & Sullivan operas. Some of his film and television credits include The Best of Gilbert & Sullivan (1983), The Story of Ruth (1981), Murder Must Advertise (1973), Jack Point (1973) and The Edwardians (1972). Pratt passed away on January 11th, 1995. Escaping from Gallifrey slightly regenerated, The Master flees to the Union of Traken, where he hopes to tap into the planet’s bio-electronic source. “The Source” controls all power within the Traken Union, and with it’s power he will be able to regenerate. Disguising his TARDIS as the calcified creature “Melkur,” he manipulates Consul Kassia into allowing him to become the new Keeper of Traken. However the Doctor foils his attempts to gain total control of the Source, which rejects The Master. With a new Keeper in place Traken’s future seems secured, and the Doctor departs. The Master however, still retaining some of the power of the Keepership, absorbs Consul Tremas’ body, effecting his 13th regeneration. It is never stated how many years have passed between The Master fleeing Galifrey at the end of The Deadly Assassin and his arriving on Traken. Nor are we told whether he had stopped on any other planets along the way. What we do know is that he spends several years on Traken, as Consul Kassia is a young girl when the “Melkur” first arrives. This may suggest that The Master needed several years for his body to utilize the power from the Eye and restore himself. As in The Deadly Assassin, The Master’s body is still in its degenerative state, although not as decayed as it’s previous incarnation. The production team reused the costume and skull cap created for Pratt’s Master, but allowed much of Beevers’ face and eyes to show through. This allowed for a greater range of emotions to be displayed by the character while suggesting that some form of regeneration took place after his encounter with the Eye on Gallifrey. Geoffrey Beevers has enjoyed a long and varying career, appearing in over 40 films and television programs. Before appearing as The Master, Beevers played Private Johnson in the 1970 Jon Pertwee episode Ambassadors of Death. Some of his television and film credits include Bertie and Elizabeth (2002), Greenwich Mean Time (1999), Goodnight Mister Tom (1998), Napoleon and Josephine: A Love Story (1987), Curse of the Pink Panther (1983), and Victor/Victoria (1982). 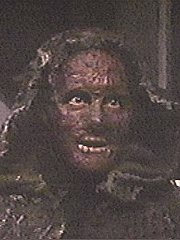 He is currently married to actress Caroline John, who played Liz Shaw during Pertwee’s first year as the Doctor. Regenerated, The Master once again plans to gain revenge on the Doctor, who he lures into a temporal trap on Earth. The Doctor, of course, escapes, but unwittingly brings The Master to Logopolis, where he hopes to once again gain control of the universe. Once again the Doctor defeats his plans but at the cost of his fourth incarnation. The Master then tries to trap the newly regenerated Doctor in the temporal trap of Castrovalva, a world which is slowly closing in on itself. The Doctor escapes but The Master becomes trapped within his creation himself. Escaping, he finds himself trapped on prehistoric Earth, where he encounters the hibernating race of the Xeraphin, an alien collective intelligence of immense power. Hoping to use their life-force as a power supply for his TARDIS, he is yet again stopped by the Doctor (who traps The Master on the Xeraphin home planet). Escaping he once again makes several attempts to pervert Earth’s history, including an attempt to prevent the signing of the Magna Carta, and the beginning of the Industrial Revolution (where he teams up with the Rani). Each time he is defeated by the Doctor, and each time his frustration and obsession to destroy the Doctor grows. He comes closest to achieving his two greatests gold’s during the 6th Doctor’s trial, where he organizes a coupe on Galifrey. Escaping from the TimeLords, The Master finds himself stranded on an unnamed planet, a planet where the genetic experiments of the inhabitants have mutated the survivors into Cheetah People. He is overcome by the power the planet holds over it’s inhabitants, slowly mutating. It is only by luring the Doctor to the planet that he manages to escape. 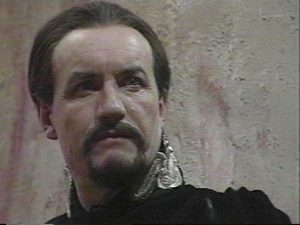 Unlike the various actors who played the Doctor (and brought their own take on the part), Ainley was given the daunting task of recreating the character Delgado made his own ten years previously. 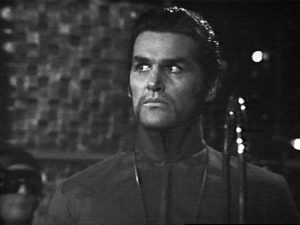 Ainley’s Master was different from his predecessor however, in that as the series went on Ainley’s Master becomes less interested in controlling the universe and more and more obsessed with humiliating and destroying his old foe. Therefore his grand plans at universal conquest are slowly replaced by revenge. 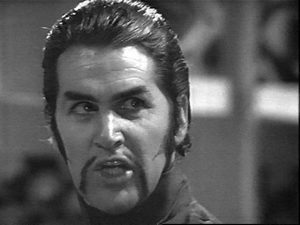 Ainley, like Delgado, made the part his own, appearing in 9 stories as the TimeLord’s nemises (1 episode more than Delgado). If the show had continued after the twenty-sixth season there is no doubt that he would have appeared in more stories. Born on August 20th, 1937, Anthony Ainley is a member of a distinguished British acting family. He made his film debut at the age of five in the 1942 production The Foreman Went to France. He has appeared in over 20 films and television series including You Only Live Twice (1967), Inspector Clouseau (1968), Oh! 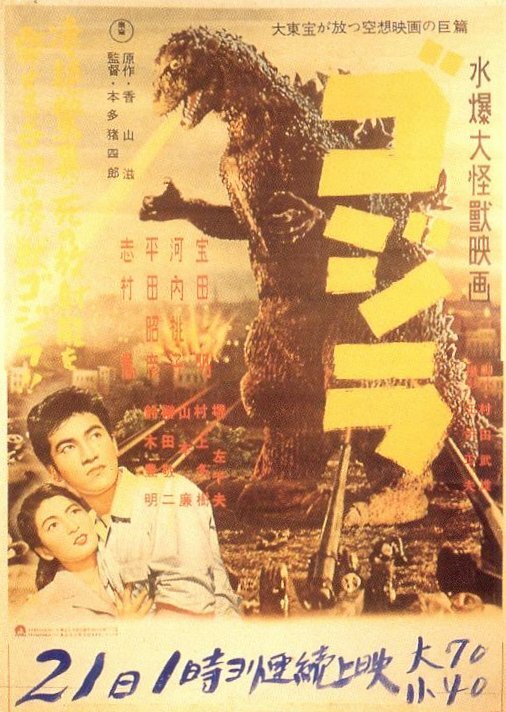 What a Lovely War (1969), and The Land That Time Forgot (1975). He has made several TV guest appearances including episodes of Upstairs, Downstairs and The Avengers. 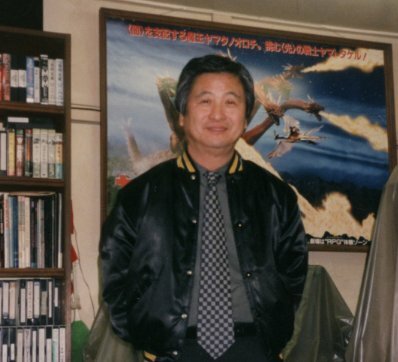 He passed away in May of 2004. Desperate to break free of the power the planet of the Cheetah People holds over him, The Master returns to Earth, where he steals Edvard Munch’s painting, “The Scream.” The Master knows that a powerful alien force is trapped within the painting, but instead of controlling the power as he had hoped, the alien force attacks him, destroying Tremas’ body and leaving him once again in a degenerative form. Realizing that the force trapped within the painting holds the key to his regeneration, he arranges to have the painting transported to the planet Duchamp 331, where the force was originally created. Bringing to the planet the force’s ancient enemy, the Krill, The Master still hopes to control and capture the force, transplanting it at the center of his TARDIS. Before he can gain control of the force however, the Doctor intervenes, confronting both The Master and his Krill army. The force, detecting the presence of it’s ancient enemies, manipulates the dust of Duchamp to attack the Master’s base on an orbiting space liner “Gallery.” The Doctor and The Master engage in a telepathic battle of wits for control of the force. In the end however, the planet and the force are destroyed. The Master’s TARDIS is thrown out into space, leaving him to search for a new way to restore himself. The inability of Anthony Ainley to come to contract and creative terms with Big Finish Productions presented the story writers with an interesting dilemma. Wanting to use the character but not wishing to regenerate him, they opted for the interesting twist of degenerating him back to his pre-Logopolis condition, having Geoffrey Beevers reprise his role from The Keeper of Traken. The result is an interesting retake on the character, with Beevers sounding almost exactly like he had in the part 20 years earlier. In addition the Master’s degenerated form allows for a logical flow of events which would occurred at the beginning of the FOX TV movie (filmed 5 years before Dust Breeding). Unable to find a way to regenerate himself, The Master devises a final plan to survive, and once again returns to Skaro, offering the Daleks one final chance to destroy the Doctor. 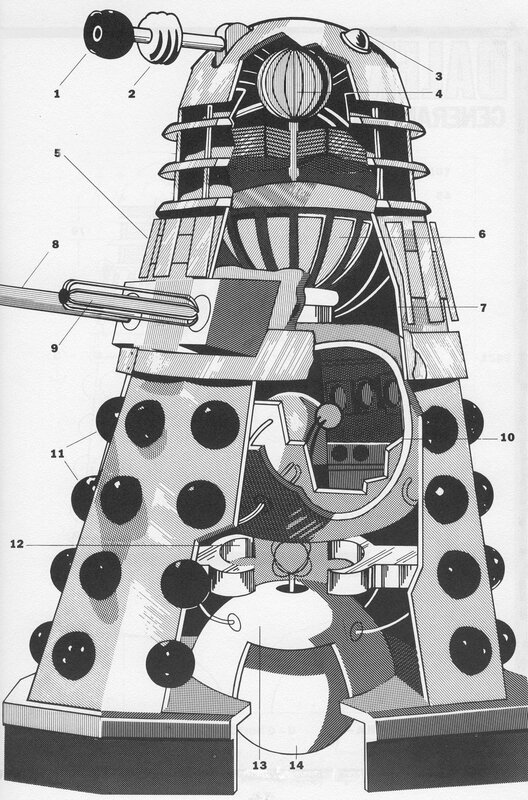 Staging a trial and execution, the Daleks lure the Doctor to Skaro under the guise of retrieving The Master’s remains. Accepting the container with The Master’s ashes, the Doctor begins the journey back to Gallifrey. The Master however, has learned to transfer his essence into a jelly-like/snake-like life form, concealed within his dying body and not destroyed by the Dalek execution squad. Forcing the TARDIS to land in 1999 San Francisco, The Master escapes from the TARDIS, inhabiting the body of an EMS technician. Knowing that his borrowed body has a limited life span, The Master plans to open the Eye of Harmony at the heart of the TARDIS and use the power source to steal the Doctor’s remaining lives. The fact that this will destroy the known universe is of little concern to him. The Doctor however, recovering from his most recent regeneration, stops The Master, yet again. The two fight within the TARDIS Cloister Room, where The Master is pulled into the TARDIS’ power source, his reign of terror finally ended. There are of course, several problems with the FOX television movie, the least of which is the notion that the Doctor would just walk up to the Daleks, accept The Master’s ashes, take them into the TARDIS and not think it was a trap. Another is the question as to exactly when the Eye of Harmony was transferred from below the Panopticon on Gallifrey to the TARDIS’ Cloister Room. It is obvious that the production company had very little understanding of exactly what Doctor Who was. 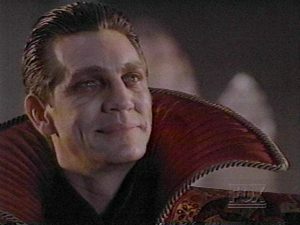 Then there’s Eric Roberts portrayal of The Master, considered by most fans as the ultimate in miscasting. Considering however that he is playing a desperate dying insane Master, his take on the role is most acceptable (and the least of the production’s problems). 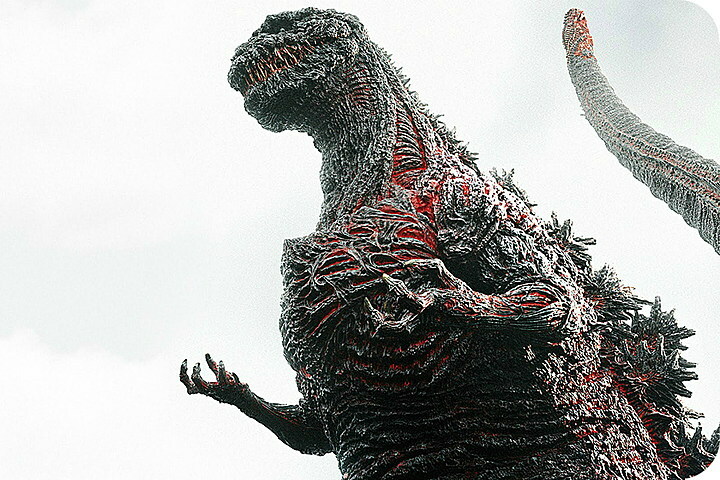 One interesting point however is the condition of the Master’s “original” body shown in the pre-credit sequence. 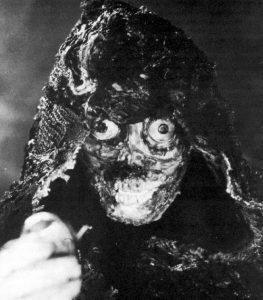 Although the far shot of the Master suggest the Delgado Master, the close up on the Master’s eyes shows the skin surrounding them as decayed and blacken, suggesting that the body of Tremas had long since degenerated. What makes this an interesting point however, is that this degenerative condition of The Master is presented in the film five years before the Big Finish story of Dust Breeding would degenerate the character back to that form. Coincidence? I don’t think so! Eric Roberts is best known for being the brother of Julia Roberts. He has received critical acclaimed for his roles in Star 80 (1983) and Runaway Train (1985), which he received an Oscar nomination for Best Supporting Actor. His other film credits include King of the Gypsies (1978), Raggedy Man (1981), The Pope of Greenwich Village (1984), and Nobody’s Fool (1986). With the series continuing in the current run of Big Finish’s Doctor Who Audio Adventures, and the the program coming back to the BBC, the future of The Master, like our favorite Time Lord himself, is open to endless possibilities. Although apparently killed at the end of the FOX TV movie, it would not be the first time within the series that a “dead” character has made a comeback (just look at Davros), making The Master’s final fate far from sealed. If this means that The Master returns to the world of Doctor Who, either in his current degenerated form or a future incarnation played by a new actor (either via a Big Finish audio, or the BBC), then The Six Faces of The Master might very well become The Seven Faces (or Eight, or Nine, or Ten, etc.). Photos from Doctor Who Image Archives.